Salicylates are a natural chemical produced by plants, believed to be used as a pest repellent, according to the Auckland Allergy Clinic. Salicylates are naturally related to the chemical compound, salicylcic acid, found in aspirin. A diet high in salicylates may offer the same type of protection against heart disease as a daily aspirin. However, some people have difficulty tolerating large amounts of salicylates and have to avoid foods containing high amounts. Symptoms include eczema, asthma, sinusitis and stomachaches. Fruits tend to contain the highest amounts of salicylates, according to Food-Info.net. 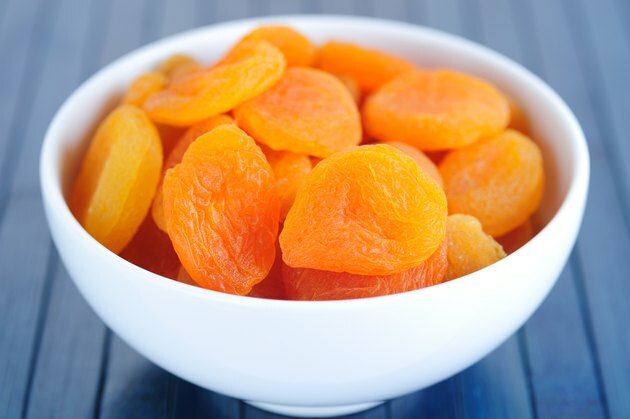 Dried fruits tend to have higher concentrations of salicylates because of the removal of water. Fruits suspected to have high amounts of salicylates include raisins, prunes, apricots, blackberries, blueberries, dates, guava, cantaloupe, granny smith apples, cherries, red grapes, mandarin oranges and tangelos. Fruits suspected to have moderate and low amounts of salicylates include kiwis, lychees, nectarines, watermelons, plums, green grapes, mangoes and passion fruit. Fruits with negligible amounts of salicylates include bananas and pears. High salicylate foods contain over 1.5 milligrams of salicylates per 100-gram serving, according to Saraband Health. Vegetables suspected of containing high amounts of salicylates include green peppers, olives, mushrooms, tomatoes, radishes, chicory, spinach, alfalfa, broccoli, cucumbers, fava beans and spinach. Vegetables with moderate amounts include asparagus, lettuce, cauliflower, onions and fresh mushrooms. Moderate salicylate foods contain between 0.5 milligrams and 1.5 milligrams of salicylates per 100-gram serving. Vegetables with negligible amounts of salicylates include green peas, green beans, cabbage and celery. A low salicylate food contains below 0.5 milligrams of salicylates per 100-gram serving. Nuts and seeds make a healthy addition to the diet. Eating three to five servings of nuts per week can lower your risk of heart disease, according to the American Heart Association. Nuts and seeds also contain salicylates. Nuts and seeds suspected to have high amounts include almonds, peanuts, pine nuts, macadamia nuts and pistachio nuts. Nuts and seeds suspected to have moderate amounts of salicylates include Brazilnuts, pecans, peanut butter, sesame seeds, hazelnuts and sunflower seeds. Cashews contain negligible amounts of salicylates. Many herbs and spices are significant sources of salicylates. In fact, it is believed that tomato sauce has high amounts of salicylates because of its seasonings. Herbs and spices suspected to have high amounts of salicylates include curry, cumin powder, dill, oregano, hot paprika, rosemary, thyme, turmeric and vegemite. Fennel, vinegar and soy sauce contain moderate amounts. Garlic, parsley and chives have only negligible amounts. Food-Info: What Is Salicylic Acid and in Which Food Does it Occur?